On Tuesday evening, two-time CMA nominee Thomas Rhett raised over $250,000 during his first-ever charity concert event THOMAS RHETT & FRIENDS benefitting 147 Million Orphans at Nashville’s The Old School. Presented by Big Machine Label Group, the up-close-and-personal night of music with Thomas Rhett as he was joined on-stage in an outdoor barn by multi-Platinum singer/songwriter Dierks Bentley, a songwriters round with Russell Dickerson, Walker Hayes and Grammy award-winning songwriter/producer Shane McAnally. 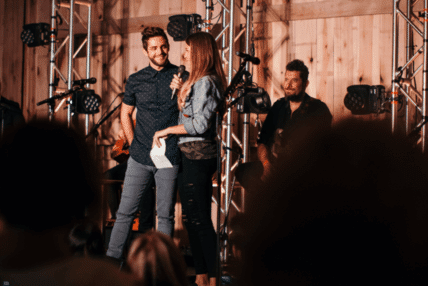 The night also included a surprise performance by Florida Georgia Line who took the stage while fans enjoyed a farm-to-table dinner, limited edition merchandise, and a post-show s’more roasting with Thomas Rhett and his wife, Lauren. As Thomas Rhett continues “pushing up against Country’s music boundaries” (Associated Press), his PLATINUM certified sophomore release TANGLED UP (The Valory Music Co.) follows the same path earning critical applause and a Deluxe edition slated for release Oct. 28. The album has produced three chart-toppers including the the 2X PLATINUM six-week No. one “Die A Happy Man” as well as the PLATINUM No. one’s “Crash And Burn” and “T-Shirt.” The singer/songwriter sparks “an ushering in of Country’s future” (Rolling Stone) as he dominates the Nielsen 2016 Mid-Year List with TANGLED UP, landing in the Top 5 Country albums while “Die A Happy Man” was the most streamed song overall with more than 80 million streams. Garnering two CMA nominations for “Die A Happy Man” after earning a Billboard Music Award for “Top Country Song” along with ACM and ACCA for “Single Record of the Year,” Thomas Rhett was also recently chosen as one of five of CMT’s Artists Of The Year which airs 10/20 on CMT at 9P ET/PT. Thomas Rhett will launch his first-ever headlining 2017 HOME TEAM TOUR with special guest Kelsea Ballerini and up-and-comers Russell Dickerson and Ryan Hurd, opening on Feb. 23 in Saginaw, MI. For more information and a full list of upcoming tour dates and appearances, visit www.thomasrhett.com.